Нутгийн ардын уламжлалт баяр наадам бөгөөд 2005 оноос эхлэн жил бүр тасралтгүй зохион байгуулагдсаар ирсэн. Зорилго: Сарлагийн тоо толгойг хамгаалах, нэмэгдүүлэн өсгөж үржүүлэх, сарлагийн ашиг шим, тэдгээрийн бүтээгдэхүүнийг сурталчлан таниулахаас гадна тус баярын орлогыг “Халуун болор” төвийн саажилттай хүүхдийн сувиллын барилгын болон үйл ажиллагааны санхүүжилтанд хандивлах. Yak Festival is annually held in July in Uvurkhangai province. During the festival, local people celebrate their heritage and compete each other. Nomadic culture in the Khangai Mountains are very strong and the area has one of the highest concentration of yaks in the world. The event is eagerly anticipated by the community and great fun is had by all participants. This event is supported to attract more domestic and foreign tourists and increase the products which are produced locally by herders and locals. It also promotes yak improvement and numbers with productivity of raw materials. 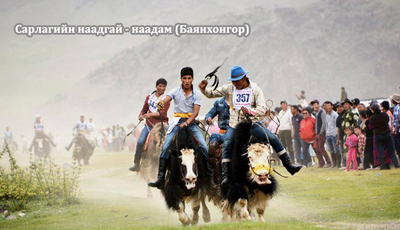 The festival starts with the yak racing which are probably one of the world’s slowest mounted racing. Aim of the event: Protection of yaks, increase their numbers and promote yak benefits, products from yak. Ticket sales of the event will be donated to the “Khaluun bolor” or “hot crystal” center fund for the further activities and sanatorium construction work for the paralyzed children. Highlights: local herders participate with their marked herds for the "Yak Naadagai-2015" Festival and during the celebration will be consecrated the Yak god and special ritual, worship to the deity of the livestock, Banzragch, to make the deity become the local deity for herders.